Damn Dirty Apes … On Mars! This just in from the BBC: Russia has announced that it plans to send monkeys to Mars! Although the idea conjures up images of a future Mars peopled by a race of hyper-intelligent chimpanzees*, it also makes sense. We want to know the physiological effects of such a long-duration flight, but nobody would want to send a human to do something so risky. So, it falls to the monkeys to do the tough jobs. Such space monkeys will join the venerable ranks of animal astronauts that have come before them, including not only monkeys, but dogs, turtles, and worms. This entry was posted on April 15, 2008 at 12:22 am and is filed under Humans in Space. You can subscribe via RSS 2.0 feed to this post's comments. Both comments and pings are currently closed. This just seems like more animal abuse to me. Despite early Soviet reports to the contrary, Laika the dog in Sputnik 2 died of heat exhaustion and panic according to a BBC report. Also these “monkeys” are Apes. Actually, the monkeys in the BBC article are macaques, though I admit that both I and the BBC reporter were sloppy with the distinction between apes and monkeys. I’m pretty sure that neither apes nor monkeys mind a little sloppiness. 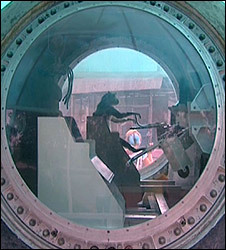 Unless the Russians are going to be able to train the monkeys to carry out housekeeping duties in flight, repair failed systems, or find a way to make them mimic in-flight activities of astronauts or just give them Something To Do, all they’d be doing is stuffing the poor creatures into a capsule, firing it to Mars, and seeing what kind of gibbering, atrophied headcases came back afterwards. As for giving us insight into the physiological effects, I reckon there would be no data from such a flight at all: the monkeys wouldn’t know to stick to a strict execrise regime, they wouldn’t be able to mimic the inflight activities of a human crew in any way. As for the mental effects, hmm, let me see… social, inquisitive animals, packed like sardines into a small space with nothing to do and nothing familiar to see… pretty sure they’d go stark raving bonkers! Do you think I could have a chance to go if I disguised as a monkey? yes you should try it out. It can be quite a challenge to monitor such an expedition. You can’t train monkeys to send hourly reports detailing the various conditions of the expedition. We need creative ways to monitor the monkeys without human intervention. >>Do you think I could have a chance to go if I disguised as a monkey? I know some folks who would qualify even without a disguise! The Russions again? Why not the Chinese? At least they still may have a use for them on return. Well you know apes may beable to do what humans cant do in space becaues of our earthly jornney. it may take years and a lot of study for us to be ready for a new life in space.